Smoked ribs ranks right up there with whole lobster as one of my favorite summer meals. They both require getting your hands dirty and give you permission to be as casual as possible. An ear of corn and maybe some coleslaw or baked beans is all you need with either protein. The process of smoking ribs used to take a home cook, like myself, a bit of trial and error using a charcoal grill. I would season my ribs, bake them in the oven for a couple of hours and then place the rack over an indirect charcoal fire with soaked wood chips for a few more hours. I had to check the coals and wood chips often. It was not particularly pleasant on a hot summer day. I graduated to a bullet style charcoal smoker/grill that made life a little easier. These days, smoking in a Masterbuilt digital electric smoker takes the process to a new and easier level. There are still several steps involved, but the smoker does most of the work. What Style of Ribs are Best? There is a whole world of rib rivalry in the US. Different areas of the country have laid claim to the best method for smoking ribs. Let’s take a look at the styles and then I’ll share a recipe for my favorite ribs, which steals from all of the best methods. We’ll focus only on baby back pork ribs. Memphis is famous for savory smoked pork ribs. This city takes great pride in using a spice and herb dry rub that includes things like garlic, onion, and paprika. The paprika helps give the ribs a deep red color and smokier flavor. The moisture comes from the meat and maybe a basting of tangy vinegar later in the smoking process. The ribs are generally served with a tomato based sauce on the side. Hickory is the wood of choice here. Kansas City is all about sweet ribs and BBQ sauce. 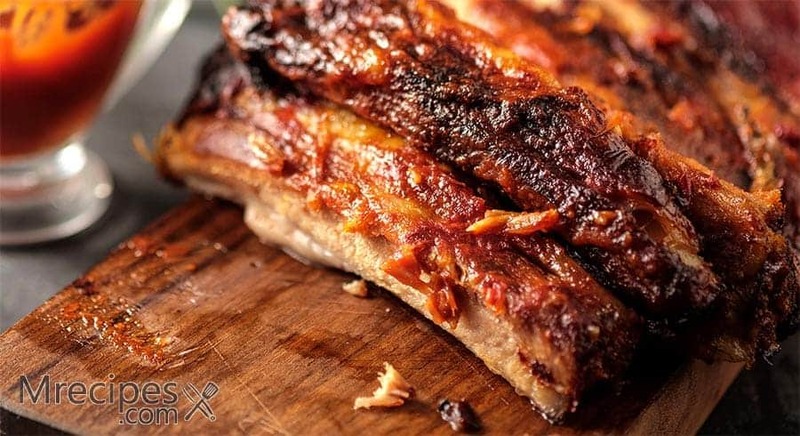 Ribs are smoked low and slow with either a sweet rub or a basting in sweet barbeque sauce that is thick and rich with tomatoes and molasses. This is the finger licking kind of rib. Any wood will do in Kansas City. The Carolinas will go all in with a whole hog. For ribs, there are 3 distinct flavor profiles. All are on the tangy side. You will find ribs with a tomato based sauce, vinegar basted ribs, or mustard enhanced ribs that are very popular in North Carolina. Hickory and oak are the woods of choice in the coastal areas of the southeast. Texas is a big smoke and BBQ state, but beef is the protein of choice, so we will save that for another smoked meat discussion. As I mentioned before, I like to blend the different styles. I find Kansas style to be a little too sweet and messy. Memphis is sometimes too spicy and a little dry. The Carolina styles are overly tangy for my taste. I do prefer to have the barbeque sauce on the side so that you can allow everyone to use as much or as little as desired. For basting, choose whichever liquid you prefer from tangy to sweet. 1. Lay the ribs flat on a clean surface, meat side down. Remove the membrane that covers the rib bones by slicing it at one end with a paring knife. You should be able to grab the cut end with a paper towel and peel the layer of membrane off. Check out this video to see how it is done. 2. Mix all of the dry rub ingredients together in a bowl or measuring cup. Sprinkle on and rub into the tops, bottoms, and sides of the ribs. Set the ribs aside to rest and come to room temperature for approximately 30 minutes. 3. Preheat your electric smoker to 225˚F. When it is ready, add some water to the removable pan that is usually on the bottom shelf. This is optional, but it keeps the ribs moist. Fill the side “drawer” with dry wood chips. For less intense smoke flavor you can use water soaked chips. 4. Place rib, meat side up, on the smoker’s wire racks. If too large for the size smoker you have, cut them in half and arrange so that they fit. Cook in the smoker for 3 hours. If you don’t see smoke after an hour or so, add more wood chips. Keep watching for smoke and add chips as needed. Make the sauce while the ribs are smoking (recipe follows). Or use your favorite jarred sauce. 5. After 3 hours, place 2 large sheets of heavy-duty aluminum foil on your flat surface. Place a rack of ribs on each sheet of foil. Baste with your liquid of choice to moisten. A spray bottle or a pastry brush works well for this step. Wrap the ribs completely in the foil. 6. Place the wrapped ribs back in the smoker and cook for an additional 1 to 1-1/2 hours, or until the internal temperature reaches 160 degrees. Serve with sauce on the side. Optional step: If you prefer your ribs slathered in sauce, you can coat the top of the ribs with some sauce and place them back in the smoker for another hour. This is referred to as the 3-2-1 smoking method. 1. In a large saucepan, over medium heat, heat the oil and sauté the onions until translucent and soft, approximately 5 minutes. Add the minced garlic and cook for another minute. 2. Add tomato paste and mustard. Cook, stirring constantly, for approximately 5 minutes. 3. Add the 2 cups of water, tomato sauce, molasses, Worcestershire, vinegar, salt, pepper, and cayenne. Whisk until smooth. Simmer this on low for up to 2 hours or until thick. Smoked ribs will take center stage of your table. You don’t want to compete with the flavor and the fall-off-the-bone tender texture. The sauce will also be in the forefront. There are only a few items that I think go really well with smoked ribs, and they are all pretty simple to prepare. Here are some sides and their recipes to consider. Biscuits are classic with any smoked meat, especially in the south. Try this super simple 3 ingredient recipe from Food Network’s Sunny Anderson for buttermilk drop biscuits. Baked beans can be labor intensive or as easy as opening a can. I prefer the labor intensive method. Yet, it is similar to smoking ribs in that most of the time is spent letting the beans do their thing, such as soaking overnight and then slow cooking. It is worth the effort. Here are a few recipes from Better Homes and Garden for different techniques to make great old fashioned baked beans. No one really needs a recipe for corn on the cob. Just steam, boil, or grill some shucked ears and serve with butter and seasonings or plain if super sweet corn. You can quick grill corn on a contact grill. Here is a recipe. Crunchy, crisp, and cool coleslaw is perfect with smoked anything. It has a lot of the same flavor components as the ribs. Yet, it adds a freshness that a heavy meal like this welcomes. This recipe calls for packaged, pre-shredded cabbage or slaw mix. You could, of course, shred your own cabbage and carrots. You’ll have the time while the ribs are smoking and the sauce is simmering.